Last night I took a quiz to find out what culture I subconsciously come from. I answered 10 questions and my result was Japanese. That’s all well and good, but NONE OF THE QUESTIONS I ANSWERED WERE THE JAPANESE OR EVEN ASIAN RESPONSE. I took the quiz 4 more times using both real and random responses, and each time, got Japanese. I wonder if Japanese was the only available response for the quiz. That’d be kind of funny. In any case, one of the questions asked what your favourite food was, and my response was tied between sushi (which I didn’t end up picking until the 3rd of 4th go-round), pizza, and burgers. I looooooove burgers. I love that you can dress them up, dress them down, make them fusion, and then best of all: gobble them up! I also looooooove cheese. Cheddar (sharp, duh). Swiss. Parmesan. Colby jack. Blue. Ricotta. I could go on for hours. For this reason, cheese-stuffed burgers is one of the best inventions EVER. And I have made it my life goal to find every cheese-stuffed burger recipe on the planet and make it. I have a lot of food-related life goals. I guess I am going on and on about other topics because there truthfully isn’t much to say about the burgers themselves. 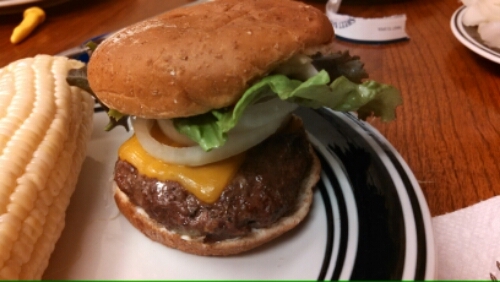 I didn’t really stray much from the recipe and I am definitely not a stranger to making cheese-stuffed burgers. If you have never done it before, I highly recommend it! Blue cheese is especially interesting, when you bite into a chunk of blue cheese – it doesn’t melt very much and therefore still packs quite a punch. I will say that I grated fresh onion (that was an interesting process) because I don’t have any dried onion flakes, and I used dried thyme instead of fresh. The beef was a bit crumbly, as I use the leanest ground beef (aka very little fat to hold it together) and there were no liquid ingredients. If yours is too crumbly and falling apart, you can add an egg, but I ended up not needing to. -Prepare a hot fire in a charcoal grill or preheat a gas grill on high. -In a large bowl, combine the beef, onion, thyme, and pepper and mix thoroughly. Divide into 4 equal portions and shape each portion into a ball. -Press your thumb into the top of of each ball and evenly distribute the blue cheese into each one, then press the beef over the cheese to enclose it, and shape the balls into patties. -Refrigerate the patties while the grill heats. -Oil the grill grate. 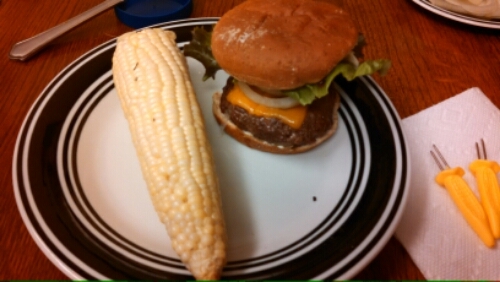 Brush the burgers on both sides with the canola oil. Place the burgers directly over the hot fire and cook for about 5 minutes per side. -Serve on toasted buns with your desired condiments and toppings!